Doors are a major hole in household insulation, letting warm air enter in the summer and exit in winter. This applies even when the door is closed. Furthermore, the exterior side of the door and door frame faces the elements, taking a more brutal beating from the weather than anything inside your house. 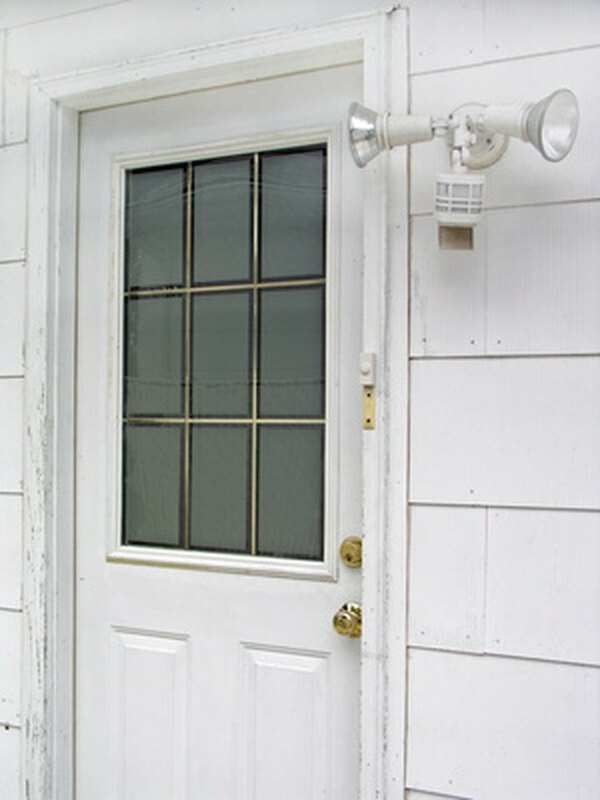 Waterproofing and sealing your exterior doors will ensure that they last a long time and help lower your utility bills. The seams, jamb and surface of this door demand regular attention. Set up a drop cloth in the door frame to catch the droplets of paint and other debris that will be unavoidable with this job. Lay down a second drop cloth outside near the door, in your garage, your basement or wherever else you intend to create your second workspace. Place a pair of sawhorses over that dropcloth, and place the exterior door on top of the sawhorses, with the exterior side facing up. Add a fan to your second workspace (where the exterior door is) if it does not have direct access to the outdoors and therefore plenty of ventilation. 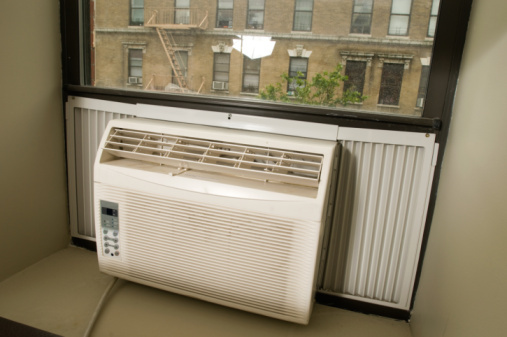 Simply place a fan of some kind near the open door or window to improve air circulation. Inspect the seams between the door frame and the exterior wall of the house. If it is not already caulked, apply a bead of exterior silicon caulk with a caulking gun, using steady pressure on the trigger. Fill in those spaces, and then scrape away excess caulk with a putty knife. 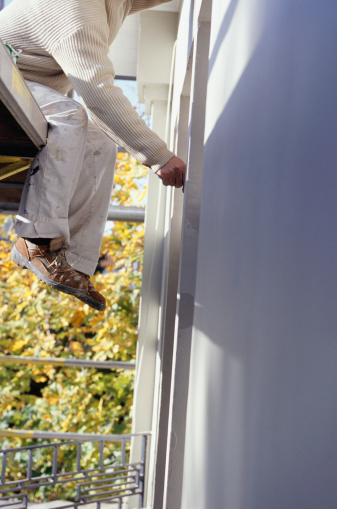 Apply a layer of exterior primer to the top and sides of the inside of the door frame with a paint brush. Include the threshold if it is not meant to have the same wood finish as the floor of the room behind the door. Allow this to dry for six to eight hours, and then apply two coats of exterior paint in the desired color to the door frame, allowing the same six to eight hours between coats for each to dry. Apply primer and paint to the front (exterior side) of the door, as well as to its top, bottom and sides. Leave the back (interior) side for when you paint the interior room behind the door, since it may be a different color than the front and sides. Skip this step if you are using a pre-treated door with a wood finish. Hang the door on its hinges and close it. Measure the top and sides of the door frame with a tape measure. Also measure the bottom of the door for a door sweep. Use these measurements to cut down your weatherstripping and door sweep. Use a hacksaw if the weatherstripping is wood or metal, and a knife if it is rubber. Set the top piece of weatherstripping in place, so that the flange is flush with the door. Fasten it with a hammer by driving in the nails provided with the weatherstripping kit, placing the nails about two inches apart. Repeat for the two pieces of weatherstripping meant for the sides of the door frame. Set the door sweep over the bottom of the door, so the flange is just touching the threshold of the door frame. and mark the screw holes. Drill those holes, put the door sweep back into place, and fasten it with screws.